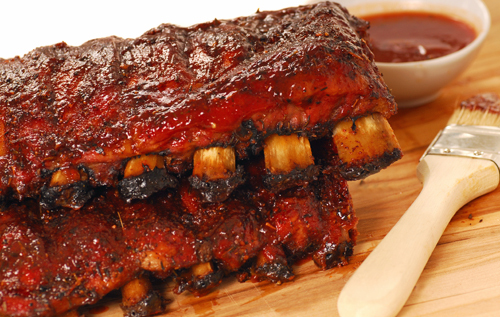 Fully cooked Baby Back Ribs are so tender and juicy that the meat falls right off the bone. Our special sauce makes these ribs positively habit-forming! A taste sensation you won’t soon forget. Just heat, serve and watch them come back for seconds! Broiling: (From thawed) Preheat broiler to 400F. Placed thawed ribs under broiler on center oven rack. Turn after 3 minutes. Broil another 3 minutes and remove. Grilling: (From frozen) Place ribs on preheated grill. Cook for 30 minutes turning every 5 minutes. (From thawed) Place ribs on preheated grill. Turn after 5 minutes and cook another 5 minutes then remove.